As we kick off 2018, I am sharing the seamless start-to-finish process of how I meal plan as a dietitian mom to two apprehensive eaters. In these weekly blog posts, you will start to see a new flow for how the posts here on Veggies & Virtue will look in the coming year. 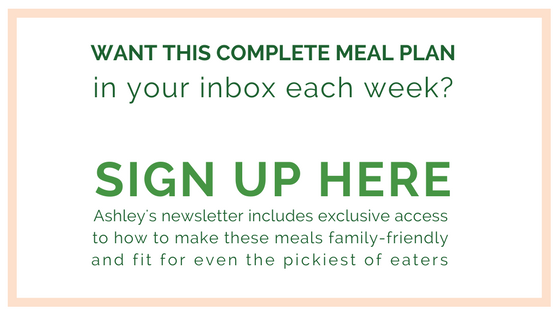 Each week, I will walk you through my five-step meal planning process to help equip you to plan, pick, pair, purchase, and prep healthy, wholesome options for your family. Even if you have a picky eater (or two!) at home as well, my aim and intention is that these posts will help you to build a foundation for "Less Meal Time Stress and More Feeding Success" in 2018! How do you plan out what is realistic for your week? Sometimes, life requires you to be ready to hit the ground running each day with breakfast options on hand. Other times, you need low-stress lunches or items that are quick and easy to get on the table after a long day. Whatever is on your schedule, addressing what you have on your calendar, a need for convenience, and what amount of time you have to cook (if any) is key to setting your schedule up for success. That's why each week I will be sharing what our week looks like. 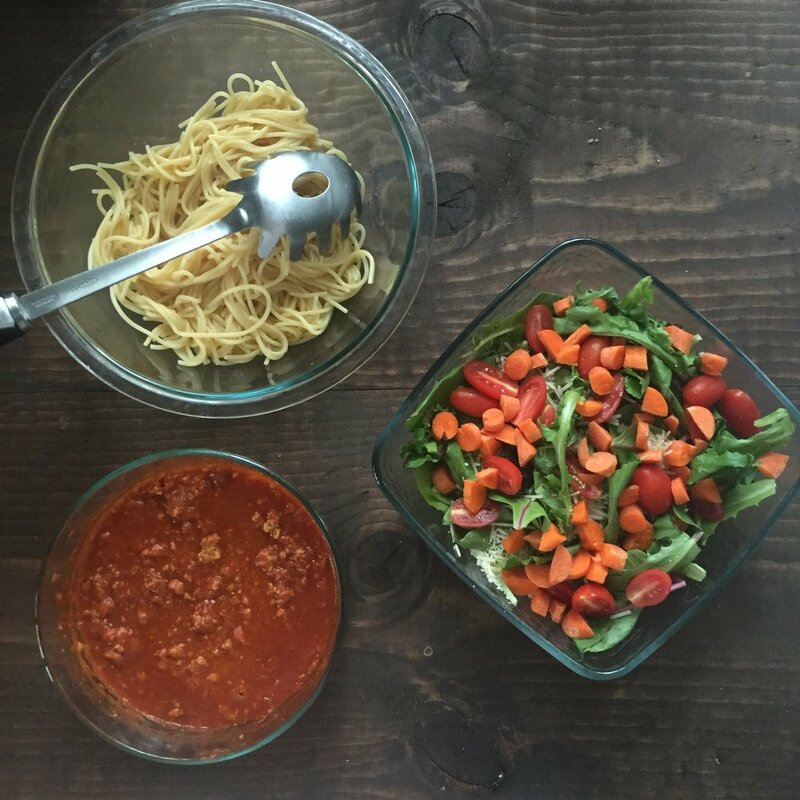 This obviously can't reflect the snapshot of what everyone's week looks like, but it will help tie in with what I pick to serve for dinner each night and how I plan ahead to achieve the goal of having a plan for at least dinner all seven nights of the week! That doesn't mean my plan is to cook seven nights of the week, but rather that I have a plan in place so that I know what's on the table each night, in advance, even if/when it is leftovers on the menu! My daughters are BOTH apprehensive eaters. The irony, I know! That's why I knew early on that in order to adopt and implement a Division of Responsibility in feeding in my home, I would have to find ways to take their food preferences into consideration without catering to them (i.e. short order cooking a separate meal when it was something they "didn't like"). 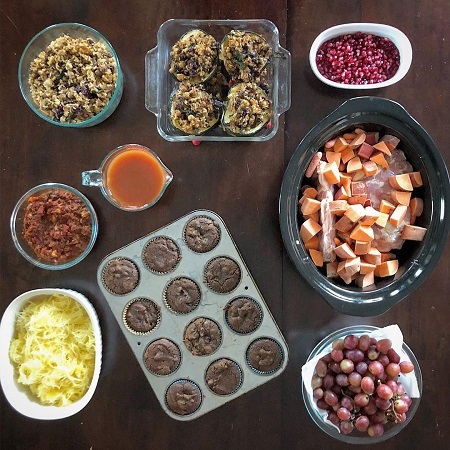 I share how to do this with each recipe on my weekly meal plan for those who subscribe to my newsletter, but I thought I would go ahead and show you here just how this works with a given meal. Stuffed acorn squash with roasted broccoli, rolls, and a side of apples, and milk to drink. Would your kid eat that? By breaking down the meal to make sure there is "something for everyone," you can transform a meal from "my kid would never eat that" to "there's always at least one thing each family member enjoys at any given meal." They are exposed to each element, even if they choose not to eat it. It is on their plate, an accepted part of the family meal, and one baby step of progress to ongoing food acceptance. I encourage you to try this approach with any of this week's meals, and then report back to me with how it goes! We will keep talking about strategies for pairing meal plans with apprehensive eaters in mind each week, so stay tuned. There will be more weekly ideas on how to get your child to become a more adventurous eater in each week's post. This week, I thought I would feature two newfound favorites around here: Angelic Bakehouse grain products and Veggie Fries. With these, we transformed the standard "cheeseburger and fries" dinner into one I felt better about serving my family. Using high-quality beef, whole grain buns, an offering of fresh spinach, tomato, and avocado, and a baked fry that my kids will actually eat, this was an easy dinner that is now a frequent request on Friday nights when we do a more casual, kick-back style family meal. You know what was even better? We ended up saving these buns by Angelic Bakehouse (shown above). The beef hamburger patty itself used to be a learning it food and the bun was something I would include as my oldest's love it food. Since she asked for cheeseburgers on the menu though and ended up eating three small cheeseburger patties in one sitting, I opted to keep the patties naked on this night and save the buns for another night (like say when we serve salmon burgers, which are a learning it food)! Does that make sense? So even though on some nights "just bread" seems to steal the show (like on acorn squash nights), that's a-okay. Be the gatekeeper to healthier alternatives to those staple "love it foods" (like Angelic Bakehouse hamburger buns and Veggie Fries "fries") as your child learns to like some of the other items being offered. Prepping the three most time-intensive dinners made for a huge stress-relief as we started the week. None of them are hard in and of themselves, but I knew that by having everything almost all ready, dinners would be on the table in a lot less stress all around. I prepped everything for the Honey Garlic Chicken Thighs but kept the marinade separate until the day I was ready to cook it all in the crockpot (which was the day after I prepped). For the Stuffed Acorn Squash, I went ahead and made the whole dish with extra filling to have for lunches. I went ahead and cooked them while I did my meal prep so that they could be eaten that night or easily reheated. With the oven already on, I prepped the Buckwheat Pumpkin Muffins while the acorn squash baked. Then by the time these were done, I was able to put these in the oven and bake them while I worked on the final few items. I love baking muffins ahead as we can have them on hand for breakfasts, snacks, or breakfast-for-dinner! For the Veggie-loaded Bison Marinara, I used our Instant Pot to cook the spaghetti squash. You could also use a microwave or the already-hot oven, as well. While the spaghetti squash cooked, I cooked the bison marinara sauce on the cooktop. Stored separately, each will stay good in the fridge for a few days. I spent about 1.5-2 hours getting all of these items washed, prepped, and cooked (for those that are cooked). I usually try to spend one nap time a week on meal prep. Is this new blog format helpful to you? Then it probably would be to someone else you know too! Please share the love with another mama using the links below. Your word of mouth referrals mean more to me than you know!